We were looking for a modern look in every detail, we loooove details. The way penguins love. My husband and I love penguins and how they do parenting, even life! The colors we choose gave us so many options. I personally looked for the fabrics and then took them to a local seamstress, and she did such a great job mixing them up. Baby Bottles with paper straws for the "welcome lemonade"
Mom and Dad Description Station (on canvas) Those are part of the nursery decoration. Message on a Diaper. We are still having fun with those inspiring and motivational messages. The bible verses on the wall with photo frames. The fruit of the spirit sewed to blankets, pillows and burp cloths. Galatians 5:22-23 22 But the fruit of the Spirit is love, joy, peace, longsuffering, kindness, goodness, faithfulness,23 gentleness, self-control. The fabrics! 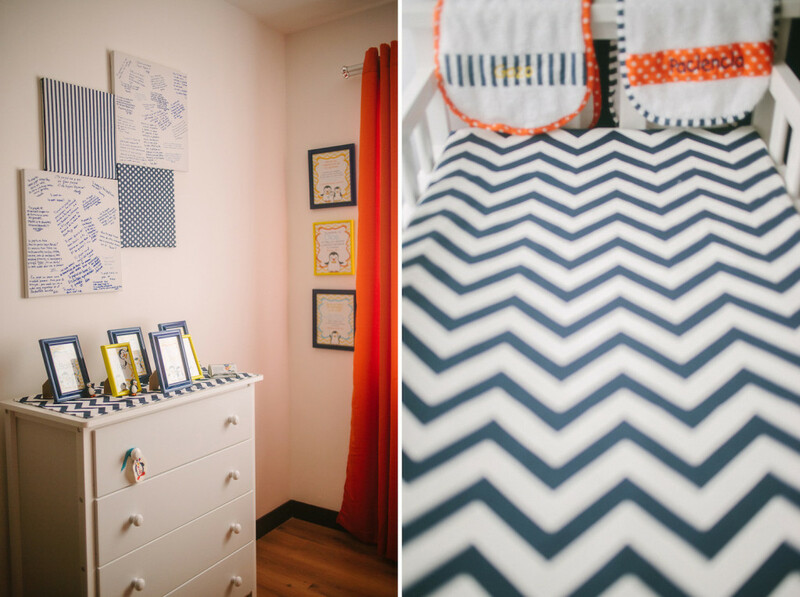 We love the patterns and colors, the perfect way to stimulate the baby sight at the same time you keep your style. Have fun with colors! Do not stick to the traditional baby colors.